Recommended to: Readers who love to devour a sweet contemporary romance every now and then. 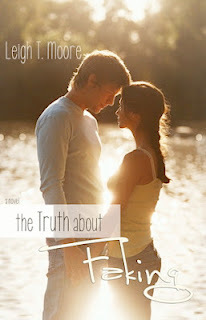 When I was first approached by Leigh T. Moore to review The Truth about Faking, I have to admit that I fell in love with the premise. What could be more fun than reading about a group of high school kids who just want to figure out love? It sounded sweet, and funny! So I jumped in head first. It took me a little while to fall into step with Harley and her friends, but once I did I was enjoyed myself. Let's start with what I loved. Jason definitely makes this list! Here is a character that is just impossible not to fall in love with. Adorable, witty, and just all together nice. It was a breath of fresh air to see a guy character who wasn't trying to constantly be a bad-boy type. I also really loved Harley's mom and dad. Her mom especially! A hippie at heart, and an herbalist by profession, she was one of those moms that shines off the page. She cared about Harley, and it showed. I so enjoy families who actually care about one another! Harley herself took me a bit longer appreciate. I'm not going to deny that I wanted to shake some sense into her more than a few times. She's a sweet girl. Misguided sure, but definitely not evil-minded. All Harley really wants is Trent, and she's willing to do a lot to get what she wants. I did appreciate how Moore gave Harley a conscience though. We've all acted on instinct, and Harley is no exception. However the difference is that Harley actually learns from her mistakes. Refreshing! Overall my biggest issue with this book was how long it took for me to become invested. I loved Jason, and because of that I wanted to shake Harley for the way she was treating him. I didn't really care for Trent. Or Shelly, who is supposed to be Harley's best friend and yet treats her pretty badly. The pacing in the beginning also felt a little rushed, and it wasn't until midway that I finally began to understand the characters. Trust me though, it's worth reading on! I loved the ending, and no I won't spoil it. Ultimately The Truth About Faking ended up being a book that I enjoyed, and that I definitely recommend. If you are a reader who loves a good contemporary romance, then this is one for you.